The peacock and his feathers have long been very symbolical, and its popularity seems as immortal as its typology. However, in the 1920’s, the peacock began a new emergence of popularity. Suddenly it’s fan shape and distinctive eye feathers were reproduced everywhere – in fashion, as decorative building motifs, and even as bouquets. Peacocks have a very personal connection for me and my family. My mom was once chased down by a peacock, and my dad can do a peacock call all too well. When I was little, my mom also hand made a very elaborate peacock costume for me one Halloween. (She sewed me a train with more than a dozen long peacock feathers that I could lift up by my wrist bands…so creative!) 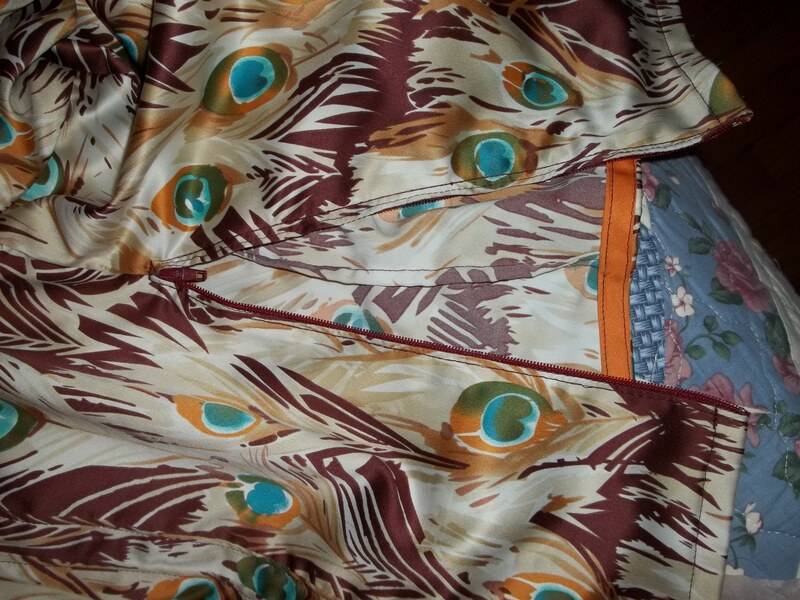 Therefore, it was a no-brainer when I saw a peacock printed fabric – I had to buy it. I bought that peacock fabric and transformed it into something from an era suited to the peacock’s popularity. 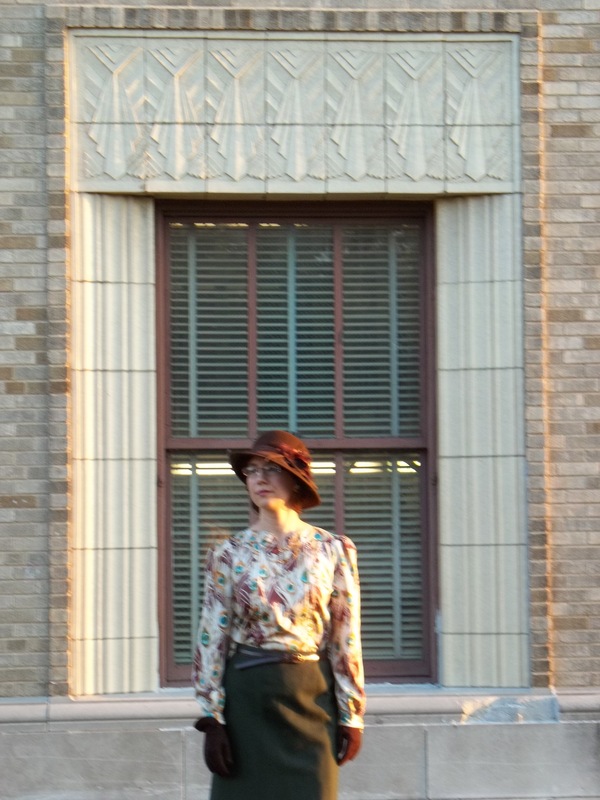 Using my favorite (and only) original 30’s pattern, I now have a wardrobe go-to favorite. 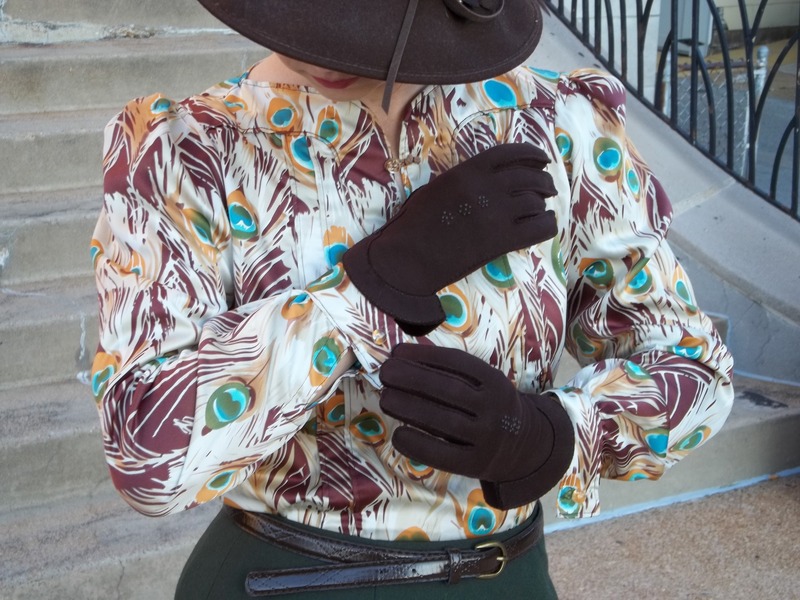 I believe my 1937 blouse puts together a smashing vintage look as well as offering the best fit and comfort ever! WEAR AGAIN? YES! YES! YES! Love it! I really have almost no Fall/Winter/Spring blouses in my wardrobe. That’s what helped cinch the decision to just make the top, actually the long sleeve version, with out the whole big project of the rest of dress to sew with it. Besides, I wasn’t quite sure how this pattern would run -big or small – and I didn’t want to fiddle with it enough to find out ahead of time. 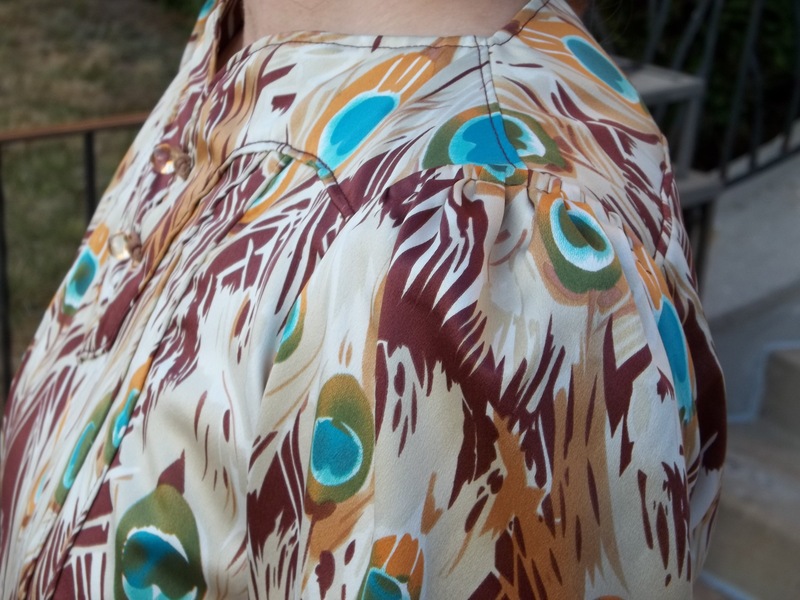 In the end, my peacock satin blouse did run small, but just small enough to still get a perfect fit. This was one of only a handful of projects which did not need a single touch of adjustment…made just for me! 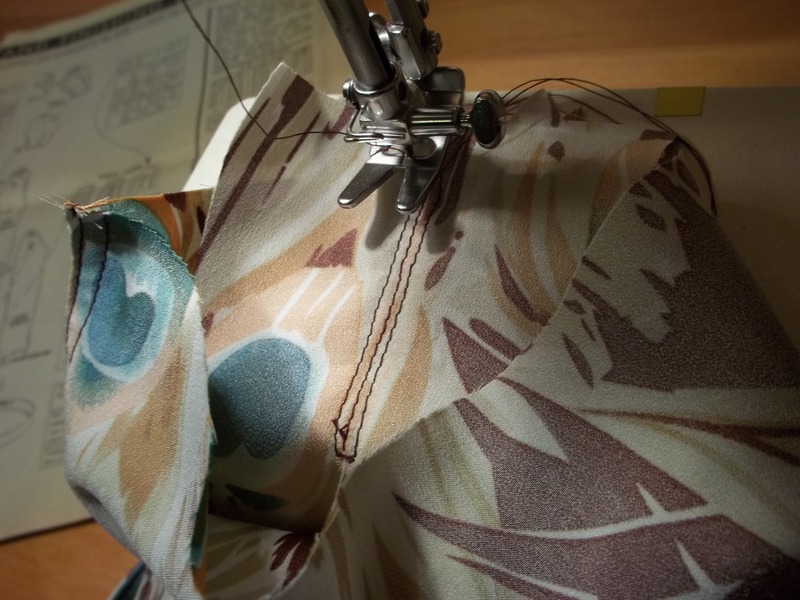 The construction details and the sewing method of putting this blouse together greatly impressed me. 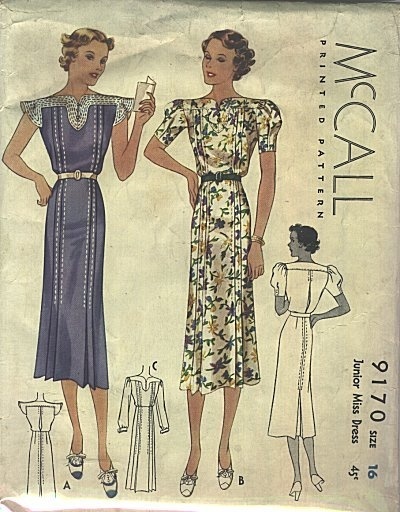 This McCall’s is an ingenious pattern, much better than modern patterns, with an assembly that teaches some excellent new and not as commonly used techniques. First and foremost, I enjoyed doing the old-fashioned way of sewing the sleeve placket. The finished look is smooth and unique. It totally makes up for the extra time spent. 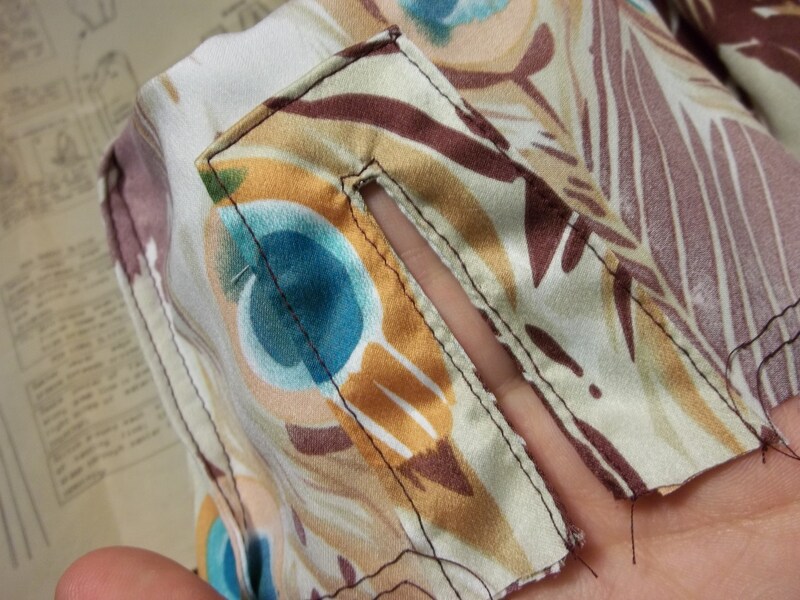 In the pictures below I am showing you how I did the sleeve openings. In the left picture, I have the small facing square, right sides together, with the tabs at the end of the sleeve matching. I have stitched in the shape of a long and skinny U, then sewed a line down the middle of that U. In the right picture, I have cut out closely around the middle stitch from between the U stitching. Next, I turned the facing square wrong sides together, top stitched around the opening, and stitched down the turned under edges of the facing. See the picture below right. Both sleeve ends get gathered into cuffs that are designed to look more like cufflinks. The instruction sheet said nothing about adding interfacing to the cuffs, and they are fine without it, but I will add it if (or when) I make this again. In lieu of button holes I sewed on clear snaps, under where the button is sewn on, to keep my ‘cuff links’ together. If I ever find some cool vintage cuff links I might end up adding button holes, but snaps work just fine for now. 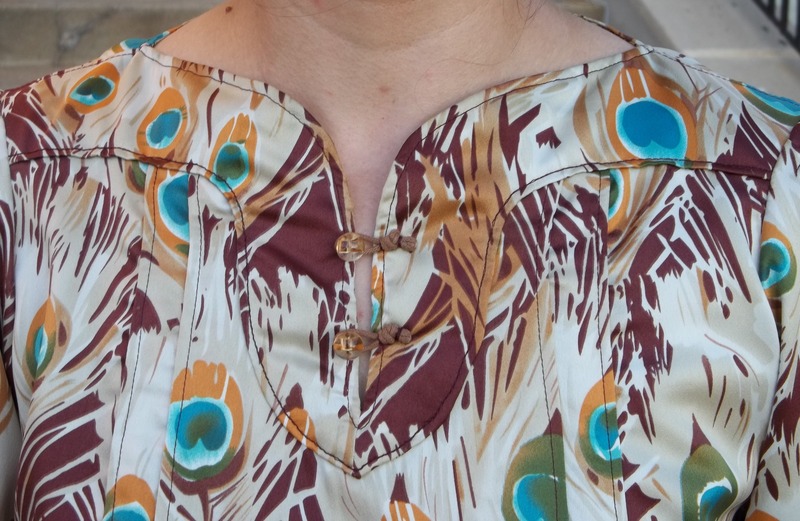 The collar placket was the most time consuming and challenging part of the satin blouse. 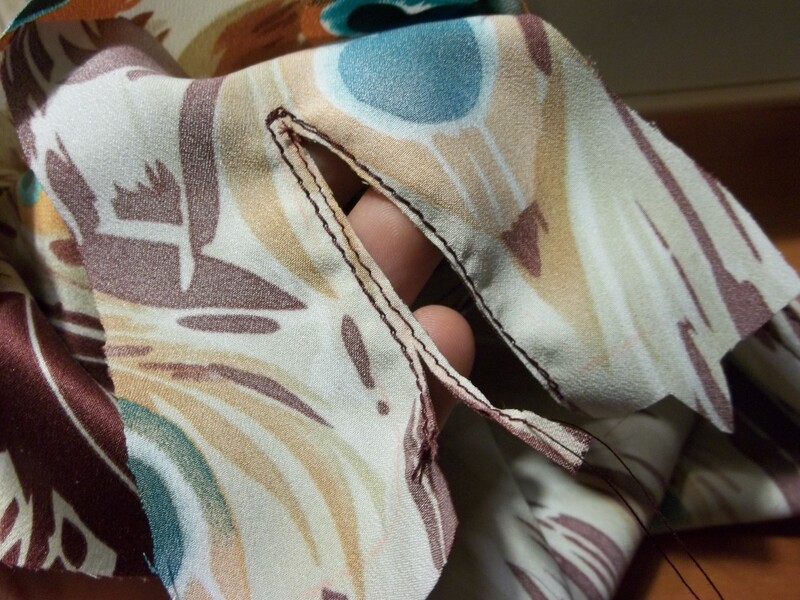 It required lots and lots of hand stitching with some intermittent hand picking of seams. The whole thing was so twisty I had to do much stretching and clipping of curves just to achieve the lapped seams needed to tack the collar to the bodice. Then, I had to sew on self-fabric facings to the entire collar! 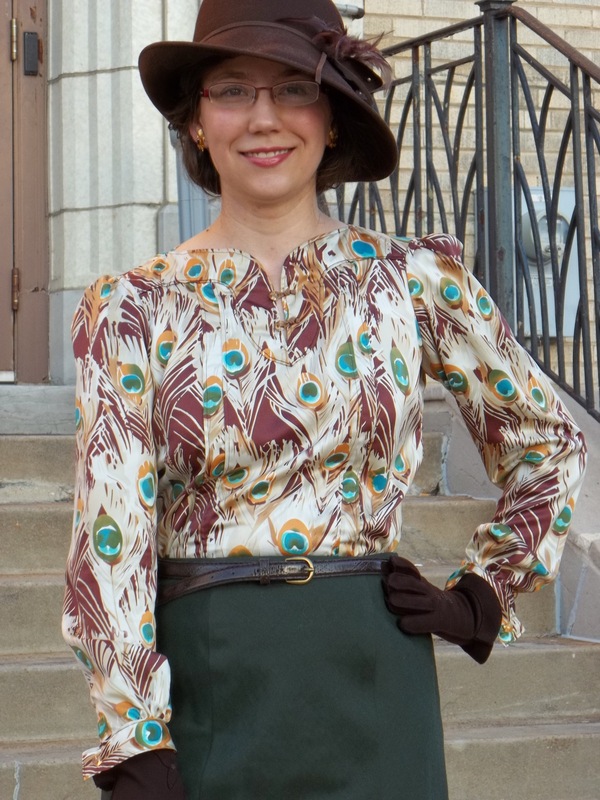 I took my time to get my corners just right on this ’37 blouse. My picture at left does show off my gathered pouf sleeve caps, but the picture below especially captures the most tricky corner of all – the one where the front and back plackets meet, around the bottom of my neck. I saved the loop closures for the buttons for last, wanting them to be more a decoration and not just purposeful. My knowledge of tying ship’s knots was utilized for the loop closures. I finished off the ends with Fray-Check and securely sewed them down. I love how the fancy loops bring attention to the button placket in a good way, showing off my skills and hard work. Did you notice all the small pin-tucks, front and back? There are 4 down the front (two on each side) and the two down the back meet each other and open up in the middle so I can move my shoulders freely. The far front bodice tucks actually conceal a cleverly placed hidden dart. There is a bust shaping dart sewn first, starting from the top where the placket gets sewn on and ending at the bust point. Only then do I sew the pin-tucks down. How very clever! The bust gets shaped from the chest area so as to take nothing away from the trim, but slightly blousy shape of the rest of the top. We have a large but beautiful building used as a telephone company switchboard hub, just a block or two away from where we live, with numerous Art Deco details all over the window moldings and especially the railings. This is where we took these pictures. 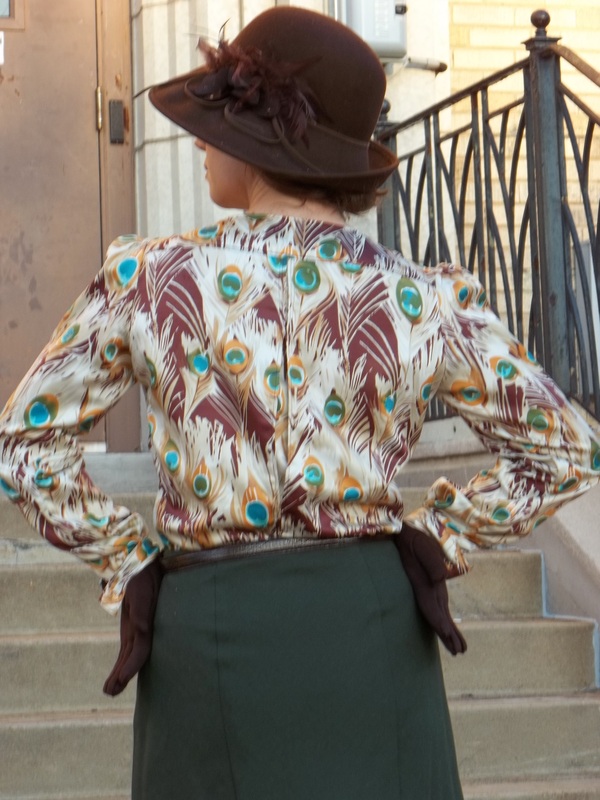 Looking at our pictures when we came home from this photo shoot, we realized the railings match the feathers in the fabric of my blouse. The same brushed, feathery shaping is shared in both. What a happy coincidence! 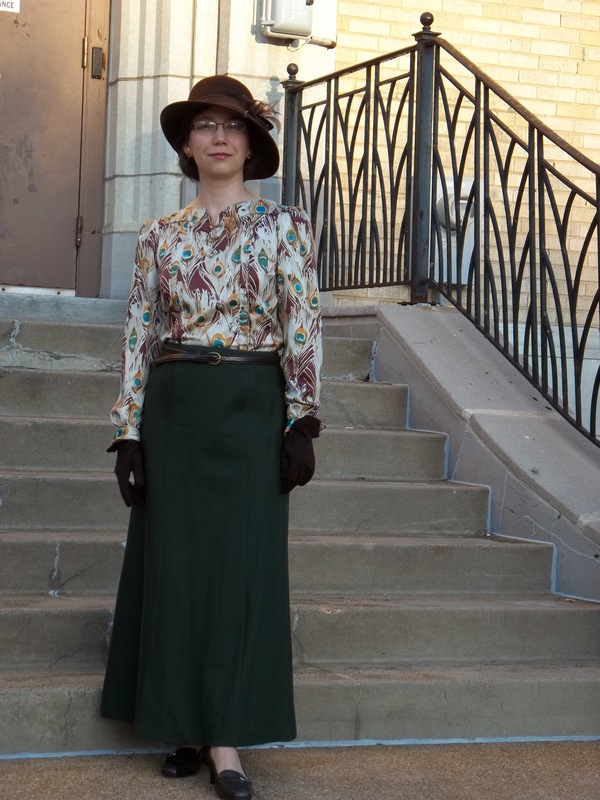 I like to show you some bonus pictures of my 1937 blouse, just for fun. 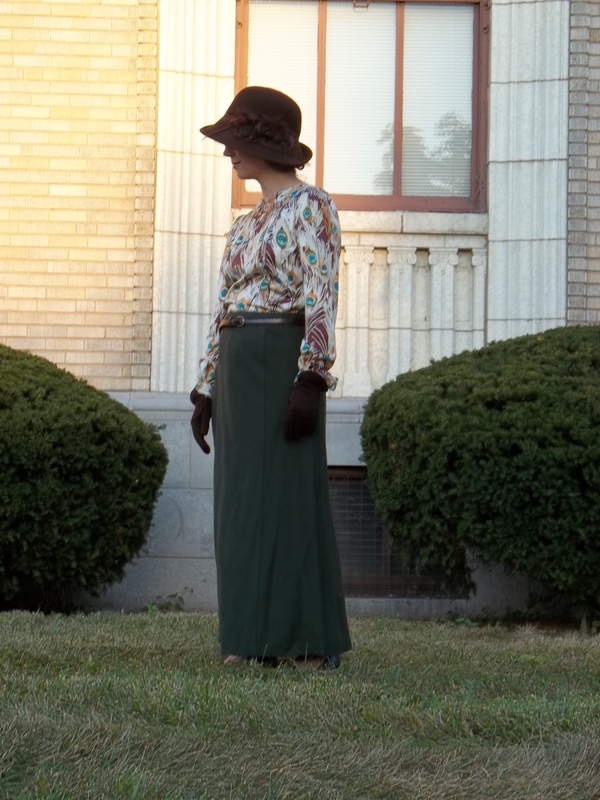 Hopefully our pictures convey how well fitted, smartly designed, and extremely comfortable my blouse is for me to wear. My blouse is one of those projects that reminds me of something – I’m so blessed to be able to sew my own clothes.